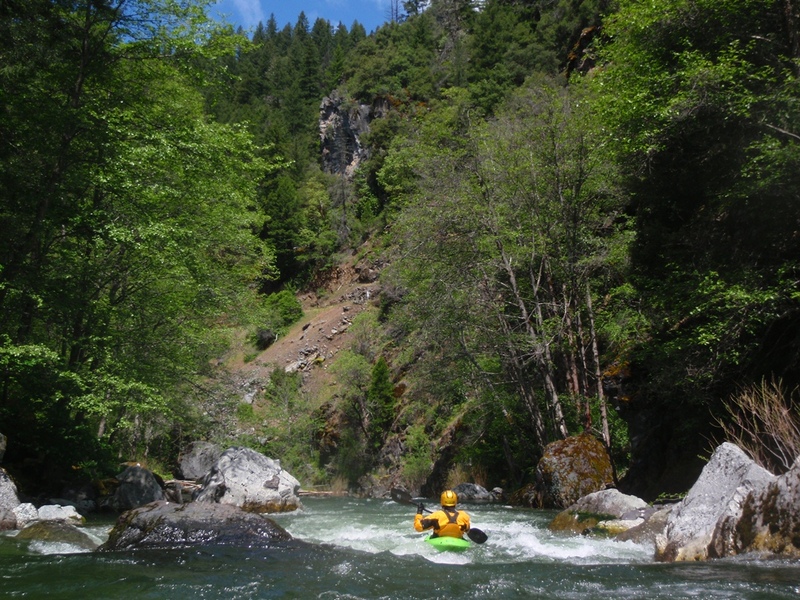 The South Fork Gorge is one of the gems in the area that every class IV-V boater who is in the area should do. 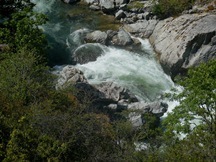 Wonderful scenery and many significant drops will keep you occupied throughout the entirety of the run. 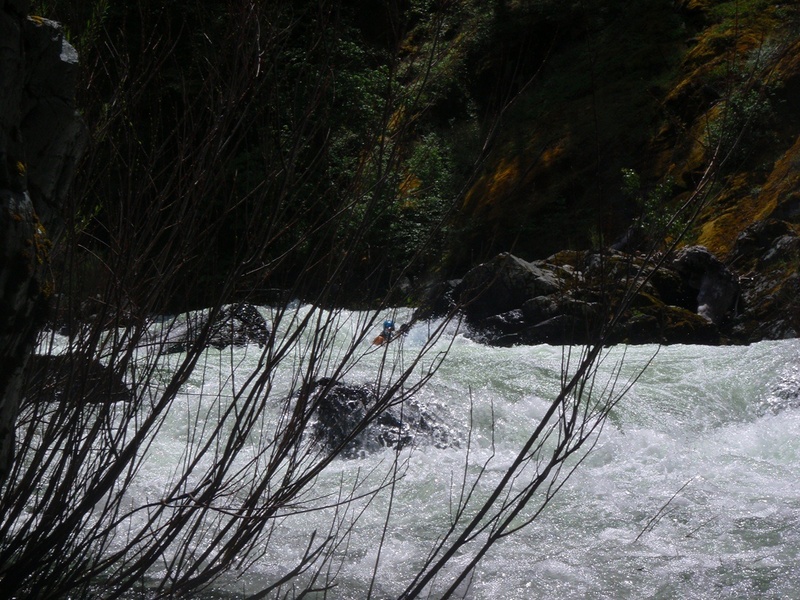 With that said, if you have someone familiar with the run, all the rapids are boat scoutable (or good off of beta) and you may not get out of your boat at all and thus get crappy pictures the whole way down the run. If you didn’t catch that, that was my excuse for the photos I took. We were with California legend and Forks of Salmon frequenter Dieter King on our trip down. 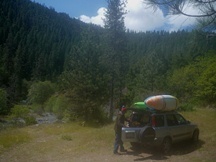 Other than 3 road scouts on the drive in and one scout on the river, we did not get out of our boats. 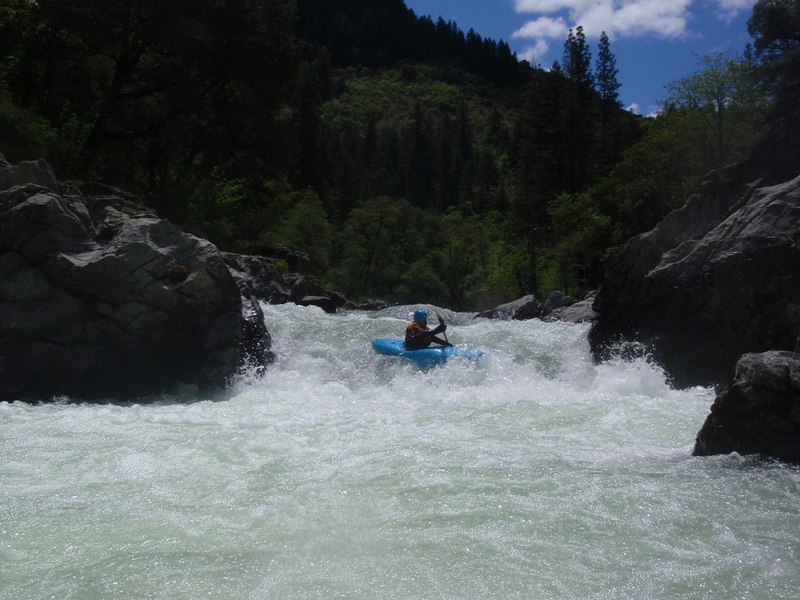 The run took us about an hour, though if you had to scout rapids, this could easily turn into three or four hours. Many drops are steep and blind and thus without the knowledge of the lines you will be forced out of your boat repeatedly. 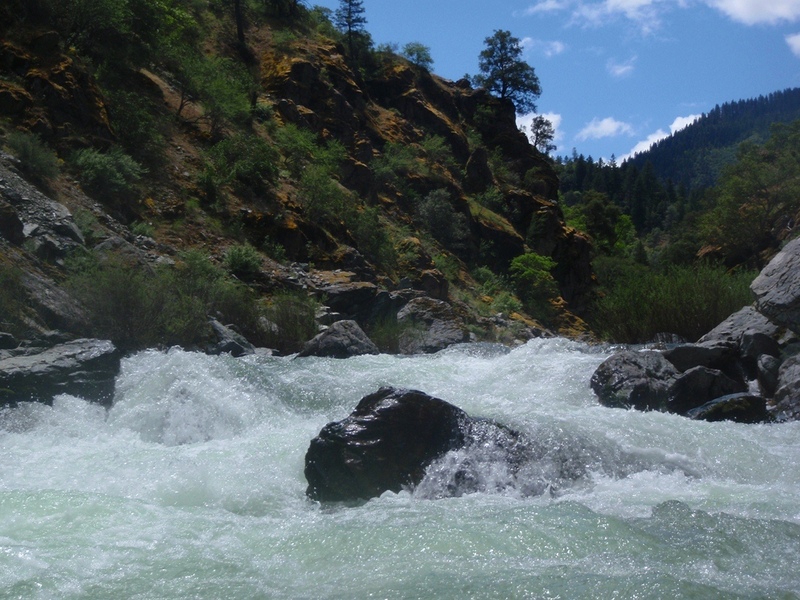 We had 1,300 +/- 200 cfs on the estimate gauge the day we did it. 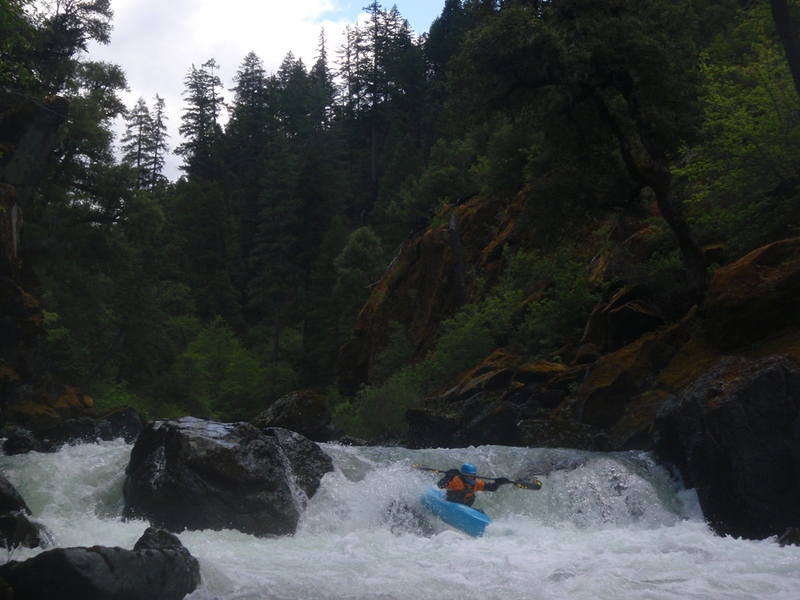 Due to several tributaries we felt like we likely had 700-800 cfs on the actual stretc itself. 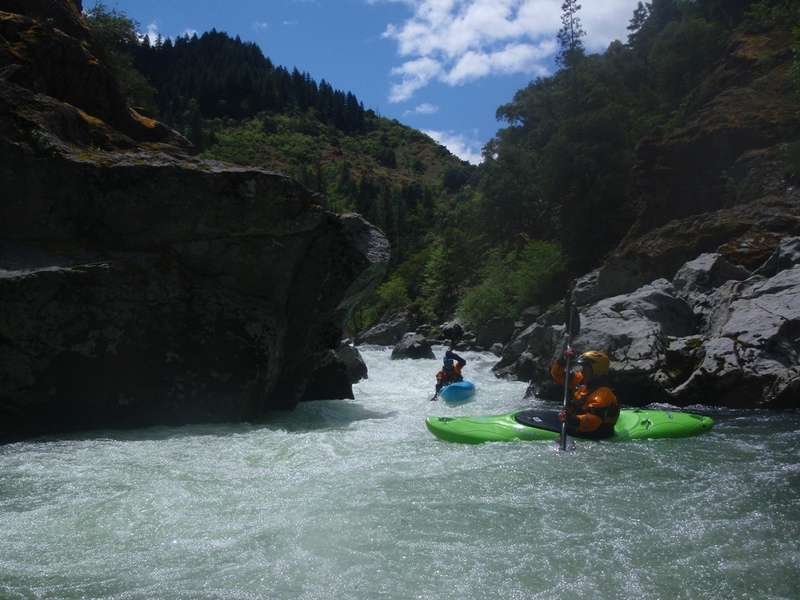 I thought this was a great first time flow and would be ideal for folks having to scout their way down the river. 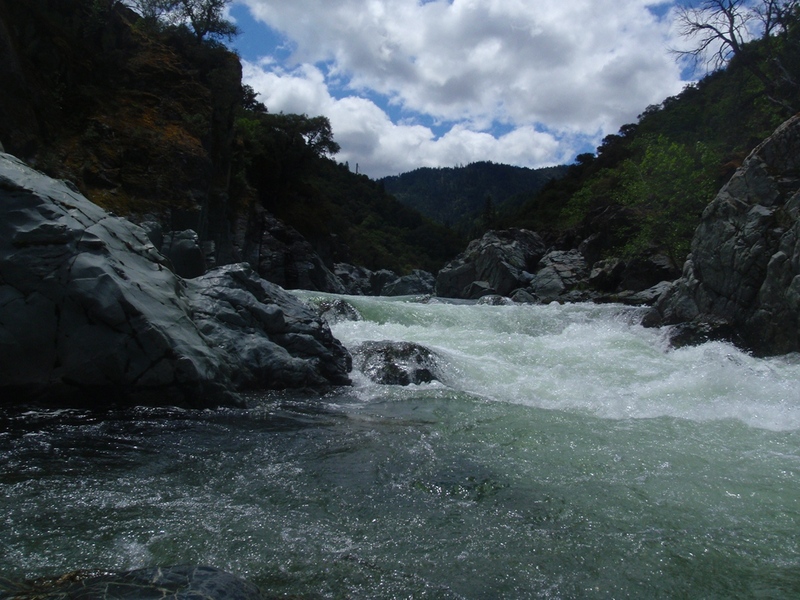 Between the rapids were plenty of pools and eddies to catch and the rapids themselves had good coverage and the holes still had some power to them. All in all, it’s great fun. 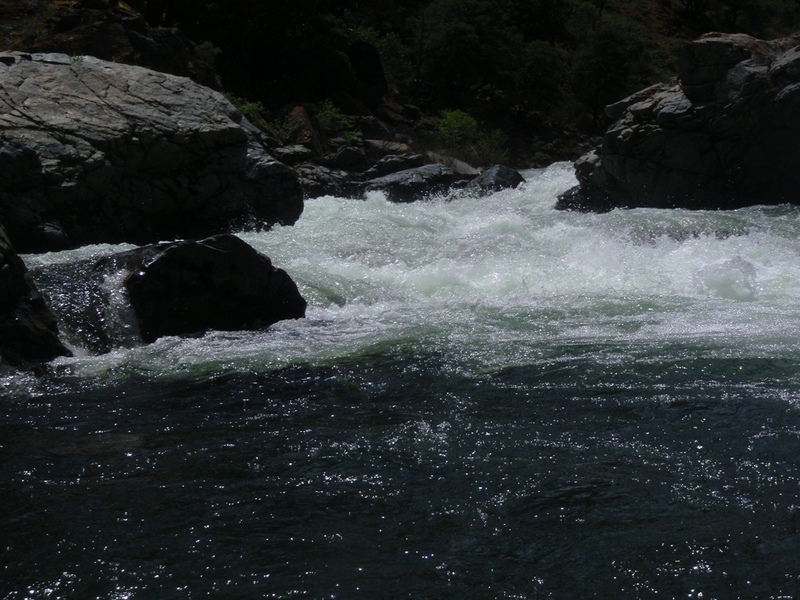 Three distinct sections stuck out in my mind, each separated by mild class II-III whitewater. The first was near to put-in and was a long rapid easily scoutable from the road on the drive up. The second was also scoutable from the road though less obvious. 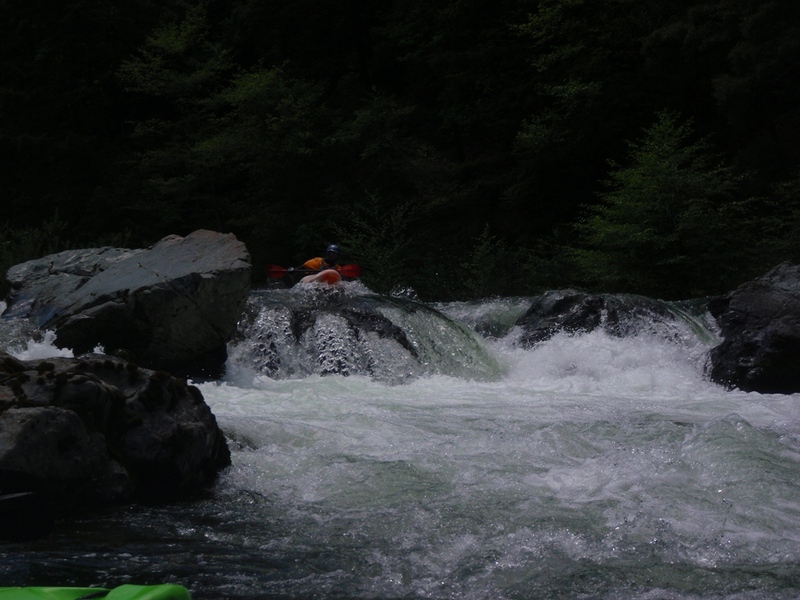 The crux of that section was the second rapid that was two tiered with the first drop pushing hard right to left thus necessitating a far right entry continuing to move right in order to avoid a backed up hole. 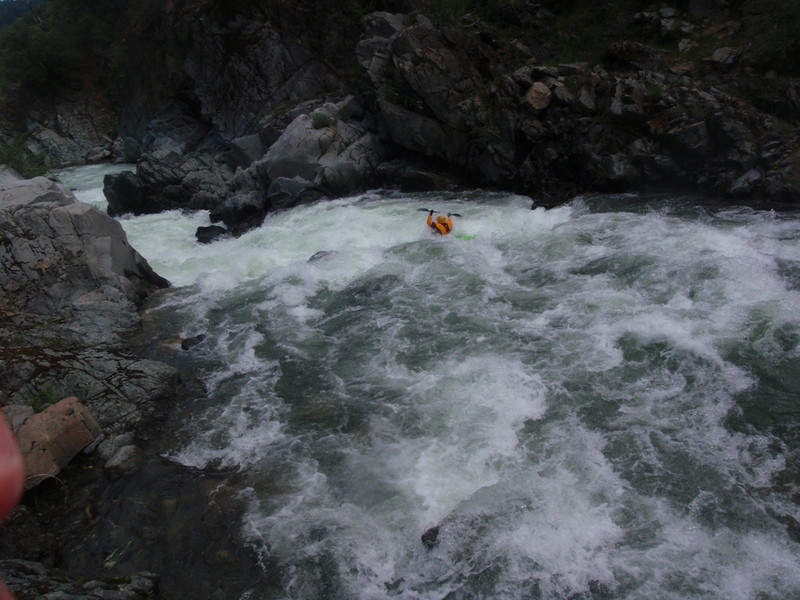 Below were several more class IV to IV+ rapids. The last section is immediately above take-out and the most significant rapids in this section can be seen from the road just above take-out. This section is totally gorged out and would make for a horrendous time for a hike out even though it is only a few hundred yards. 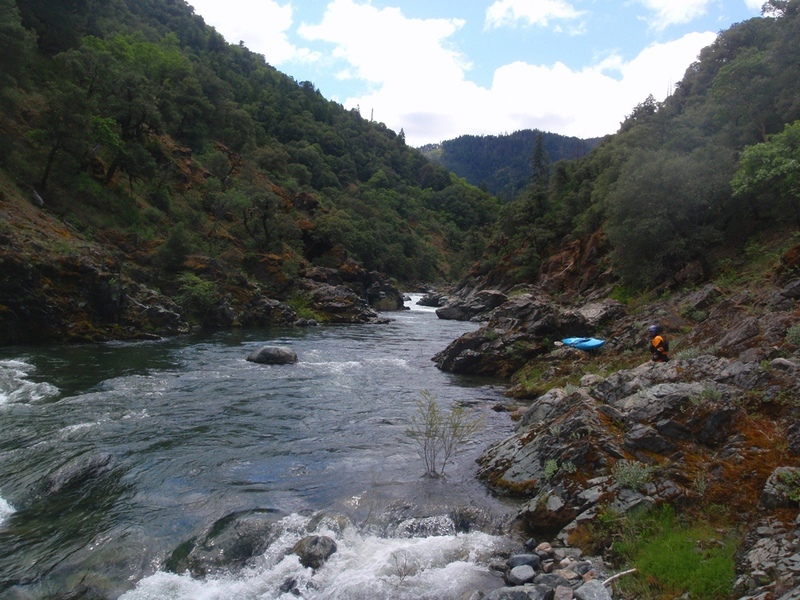 In summary, I can’t wait to get back on this section of river the next time I am in the area. 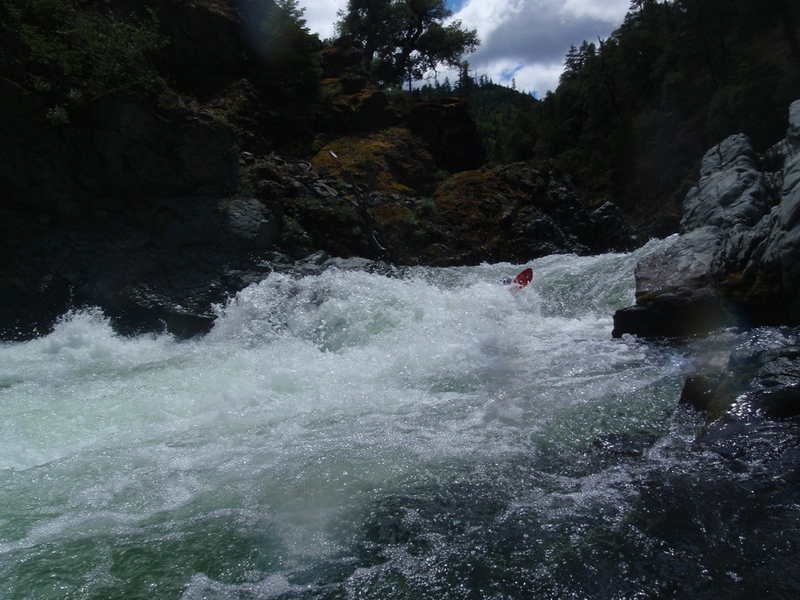 A half mile warm-up leads to the first long rapid that should be scouted from the road on the way in. Warm Up (IV+). A class III-IV lead in leads to an eddy on the right. 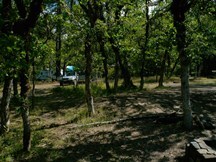 From here, drop the first big hole and drive to the eddy on the left. Peal back out to drive right over the bottom ledge boofing over the hole. 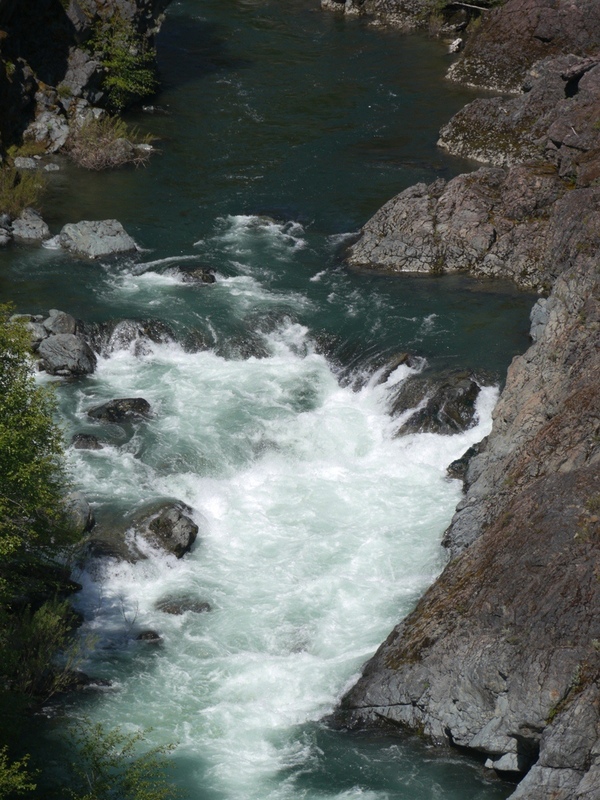 At higher flows I imagine the middle hole becomes more troublesome. Class IV boogie continues for the next mile (I think, memory is fading already and Google Earth isn’t helping) or so to the next set of rapids. Double Ledge (IV+). Scout this one from the road as well as it is blind from above. Drive right in the initial curler so you can stay right to boof through the backed up hole. 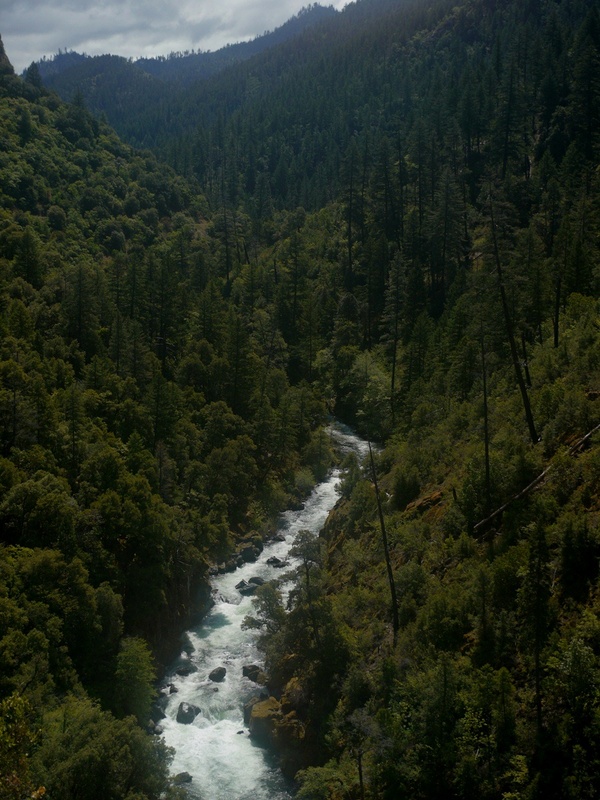 Just Downstream (IV). 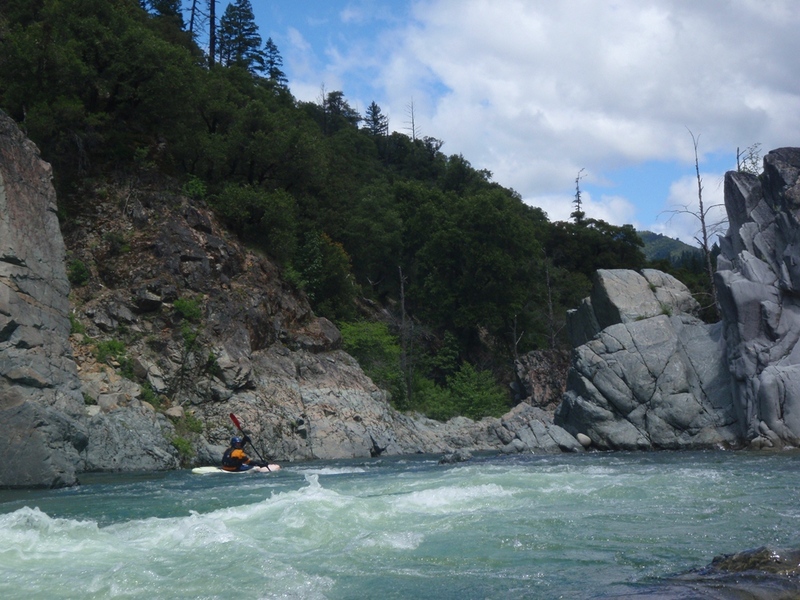 Immediately downstream is a fun fluffy rapid run down the left. Eyes Wide Shut (IV+). 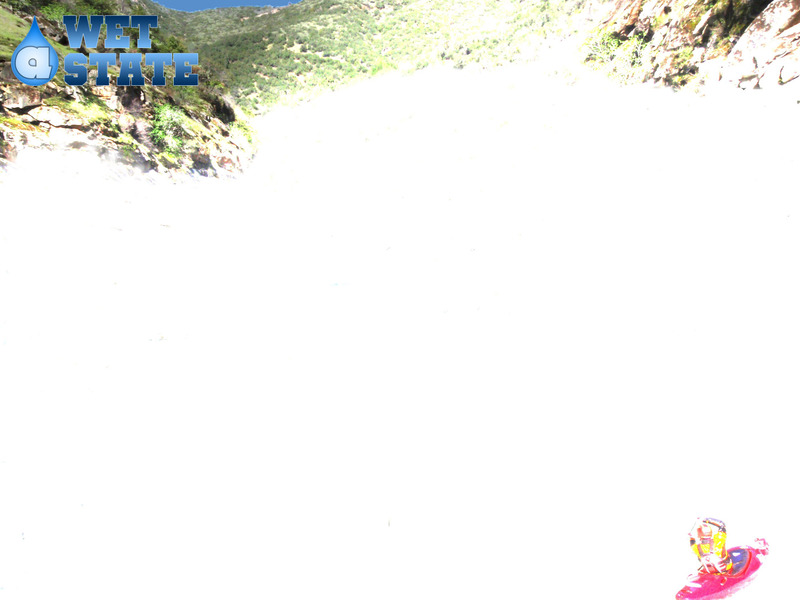 We eddied out at the lip on the rapid unsure of the line. This ensured that we had to run the meat of another very large backed up hole. It looked possible to get around it to the left if you knew that all along. As it turned out, we all got through it. Cool Chute (IV to IV+). 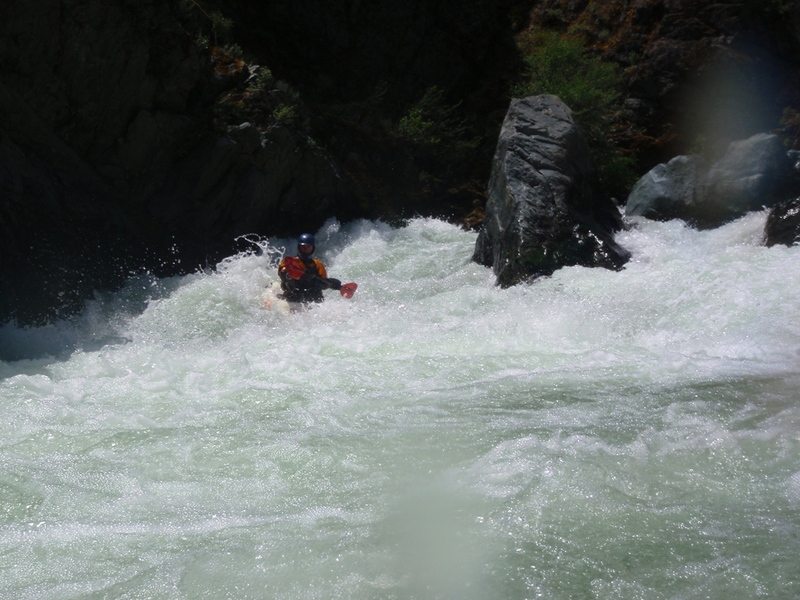 A cool read and run rapid tightens up to a chute that then bounces off the walls. Ledge (IIII to IV). A horizon line isn’t far downstream, boof the right edge or go far left. The center had some bad rocks. Around the Outside (IV). A brief class III lead in leads to a pinch along the right wall, just take the tongue down and around the right. Play Land (IV to IV+). A small version of what lays downstream. This rapid crashes between tight walls creating reactionaries to power through. Disneyland (IV+ to V). Scout left. Be center right to hit the first curler, then stay off the walls. 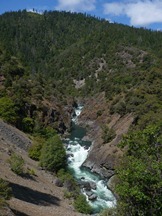 Below is a quick double drop to exit the gorge. A short section of boogie lets you relax before the finale. Entrance (IV). 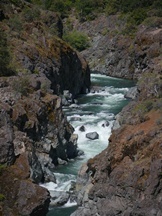 The Entrance to the final gorge is a blind rapid that you drop just left of the center rock through the hole. Read and Run (IV to IV+). Below is a hundred yards of read and run class IV that you eddy hop down. We went right, then worked back across to the left. Top Drop (IV+ to V). 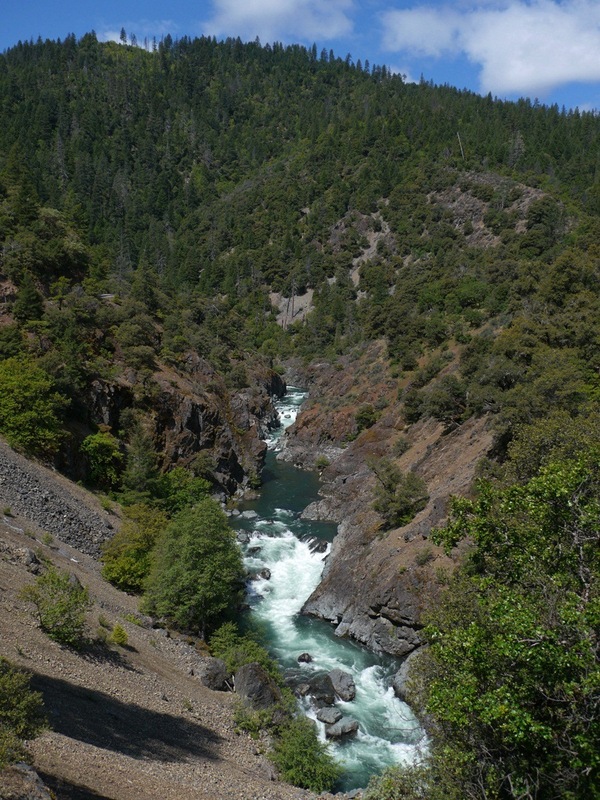 The top drop of the gorge that you can see from the road, this rapid has a history of wrecking people. We ran right, careful to stay off the wall moving back left. Folks have pinned badly over there (back 20 years) and with certain flows the hole is nasty against the undercut causing many swims. There is also apparently a center boof line. Middle Drop (IV to IV+). 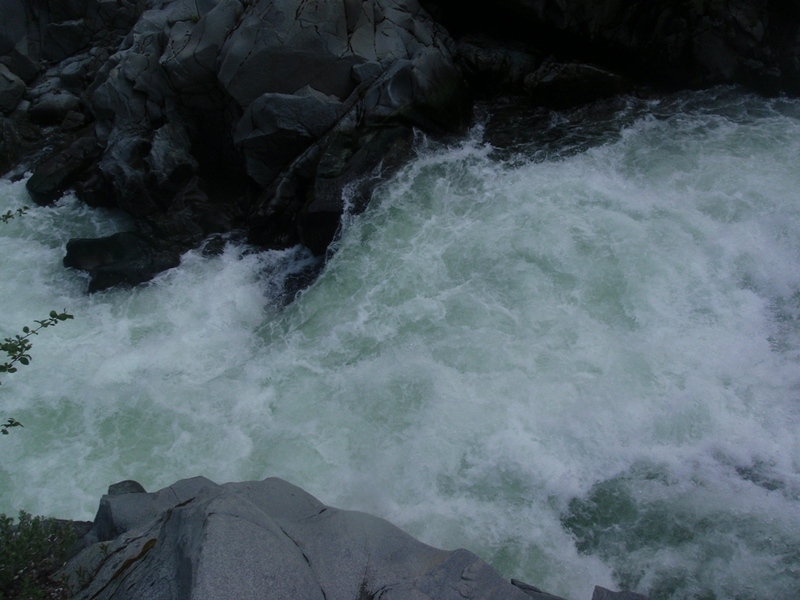 Immediately downstream is another rapid that when run well is no problem. Drop down the right, punch the reactionary and power out of the pinch before the hole stops you. Bottom Drop (IV+ to V). We boofed down the right and squeaked around the meat of the hole. This landed us in the pool 100 feet above take-out. 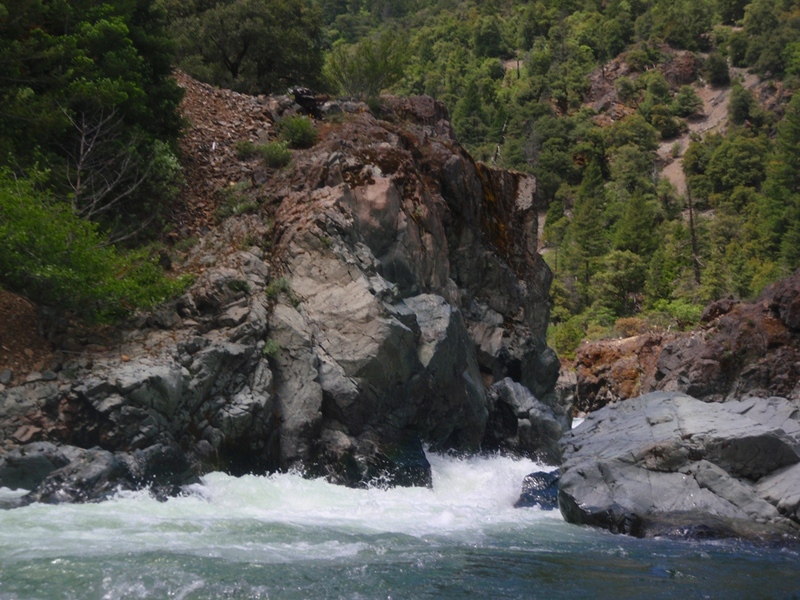 Take-out: From Forks of Salmon, drive towards Cecilville up the South Fork. 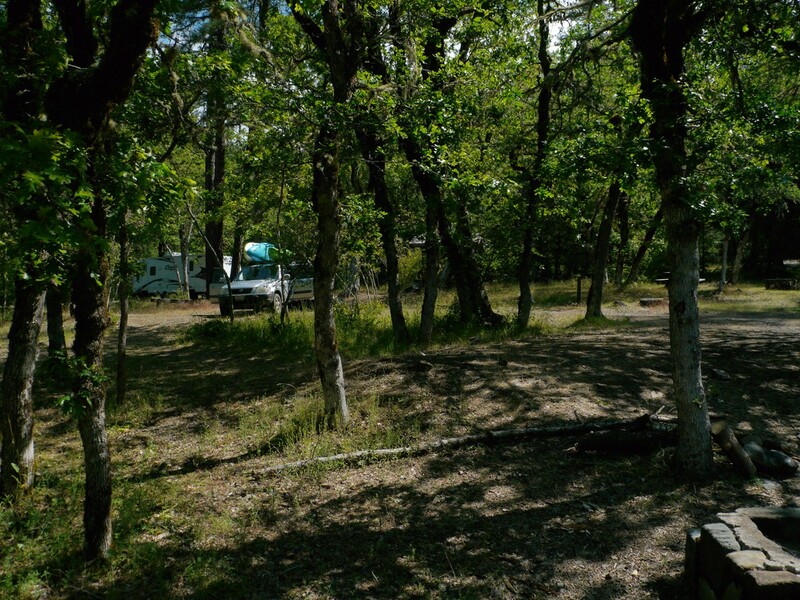 Just after the Mile 10 marker you will see Matthews Creek Campground. This is take-out. 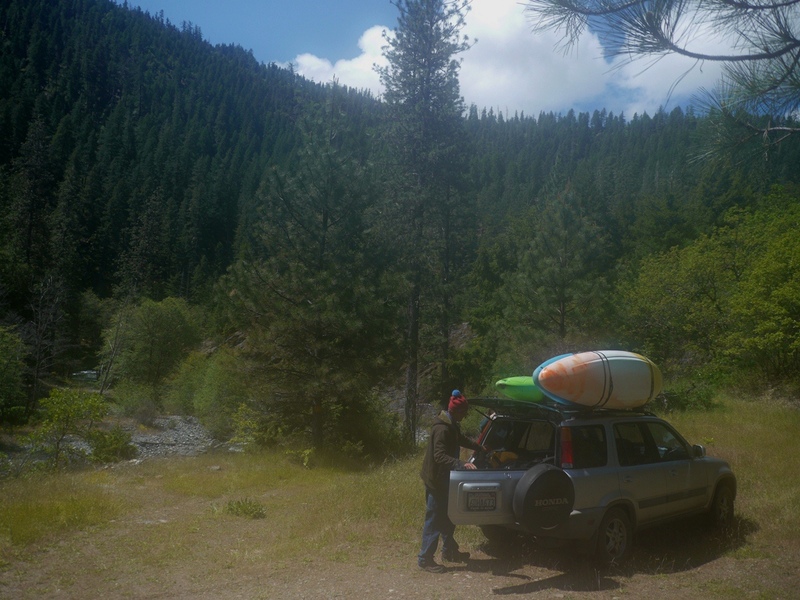 Put-in: Continue driving up the South Fork. 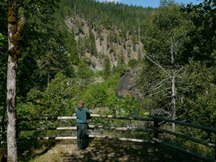 Just past the mile 15 marker is a road that drops sharply down to the right. 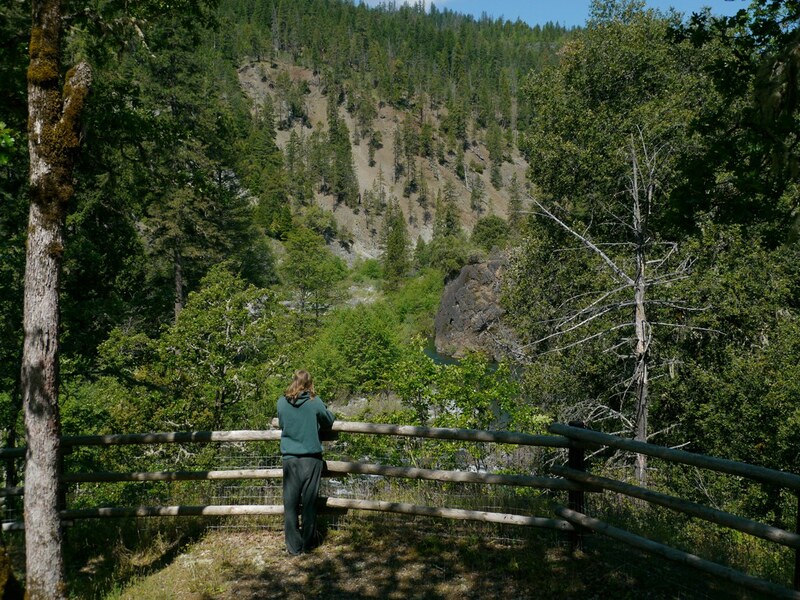 Take this 100 feet down to the river.